In the last couple of months, the saying “There but for the grace of G-d go I” (John Bradford) keeps coming to mind. It is meant as an expression of humility but I am repeating it to myself as a gratitude of all that I have. Winter in the Western Cape is always wet. It is our rainy season and snow can be expected mid August. Our temperatures do not normally get that cold and the fluctuations are not that great. We can expect day time temperatures of around 15° Celsius and night time lows of 6° Celsius. However, this winter has been an exception. It snowed the first week of June and we have already had extreme cold of 3° Celsius during the day. It has been raining a lot (enough to fill our half built swimming pool). It has also been hot enough to consider the weather more spring like than mid winter. Another feature of the area in which I live is the fact that homelessness is common place. What is called sleeping rough in most countries is nothing new to the Western Cape. And it is for this reason that I am grateful for the roof over my head. I have a warm bed to sleep in every night, and the rain to me is an aid to watering my garden. I have food on my table and I don’t need to worry where my next meal will come from. Meals can be simple, or extravagant, and a bibimbap (mixed rice) is a perfectly good example of a complete meal in one dish. I have made mine without meat and this was a perfect meal for us for lunch. As I said there but for the grace of G-d go I! Blog-checking lines: The July Daring Cooks’ Challenge took us to Korea, where Renata of Testado, Provado & Aprovado taught us to make bibimbap. This colorful rice dish can be customized to meet any taste, and is as much fun to eat as it is to say! Tandy, this looks and sounds so fresh and tasty! I do like Korean food, but have not really tasted too many dishes. It’s summer but COLD here in California, so I sympathize with you. I have times where phrases get stuck in my head too. I always wonder why, that phrase, at that time. Coconut water in the rice sounds delicious! I’m going to have to try that next time I make a batch. This is one of my favorite Korean food go-tos! Must try this recipe! I like your creativity for toppings. It is always nice to have a vegetarian meal in the rotation. Of course my boys would be running for the Korean chill powder flakes and Gochujang sauce. Very nice! I’ll have to try the coconut water in the rice next time. Hi Tandy, Gordon’s Bay sounds like a wonderful place to live, had no idea it gets so cold there. 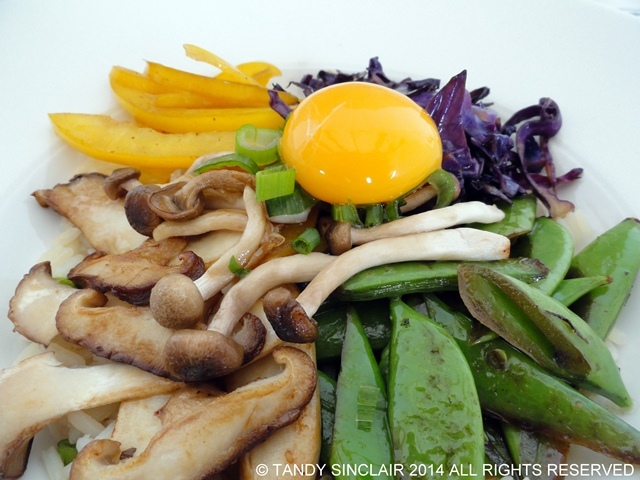 Love this bibimbap mixed rice. 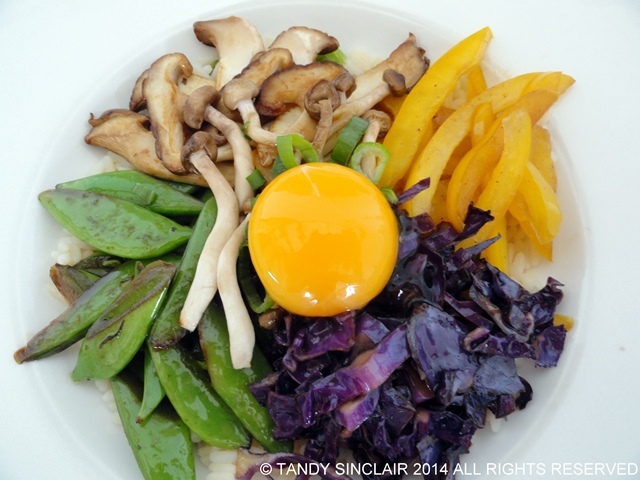 That’s beautiful food…love the combination of mushrooms with the vegetables and egg yolk. Delightful. Yum! So simple and easy. Can’t wait to try it. We live in Western NY within just a short walking distance of Niagara Falls. This summer has been the coldest yet since we moved here seven years ago. This past winter was the worst…EVER….so cold. Like you, I am so thankful to have a warm bed, shelter that is comfortable…though would like it warmer….but we have so much to be thankful for. I love your recipes because I learn something new every time. This isn’t a recipe I would typically think to make, so Un-AMerican so I love it for it’s difference! I like your meatless variety too. Our foods here are so processed! Our diet needs help. Can’t believe your weather! I’m so intrigued. Snow? Rain? Cold in South Africa? I can’t believe it. You’re so lucky!!! Our temps here (last year) got to -40 c!!!! And there was 2/3 of a meter in snow! Had never heard of this – what a lovely dish! Well done and a beautiful presentation! This recipe looks really interesting Tandy – not one that I have come across before.